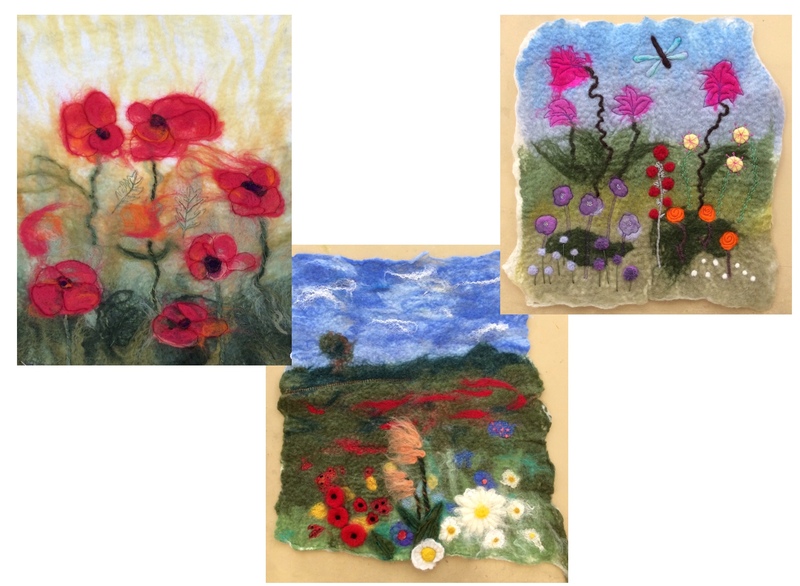 The Big Textile Show 2018…..
I’m looking forward to exhibiting again at The Big Textile Show at the end of this month. It’s being held on Saturday 27th and Sunday 28th October. Last year was my first time as an exhibitor. 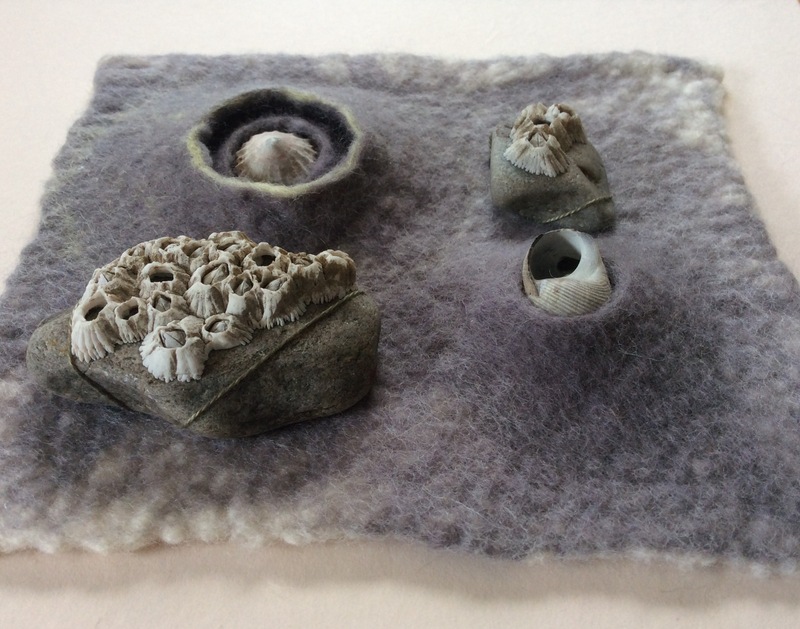 I just loved meeting the visitors and discussing my work as well as getting to see and hear about everyone else’s creations…….fingers crossed it’s as much fun this year! I’ve been busy making a selection of Nuno Necklets for my stall. 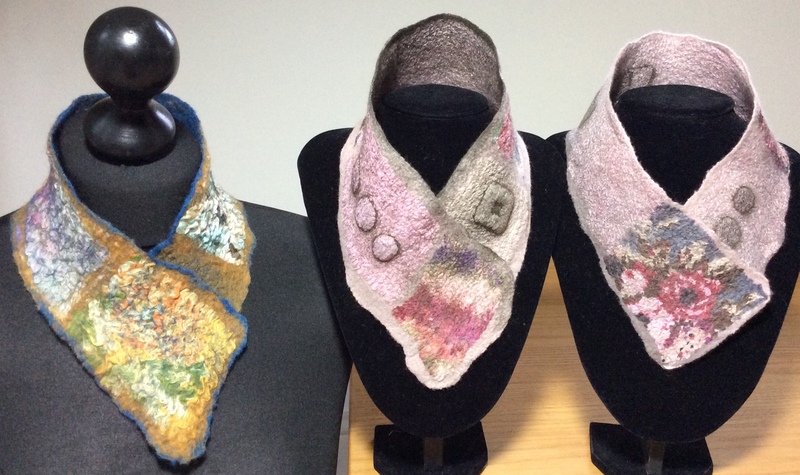 These are extremely lightweight as they are made from Superfine Merino and silk fabrics. I hope my visitors like them as much as I do! 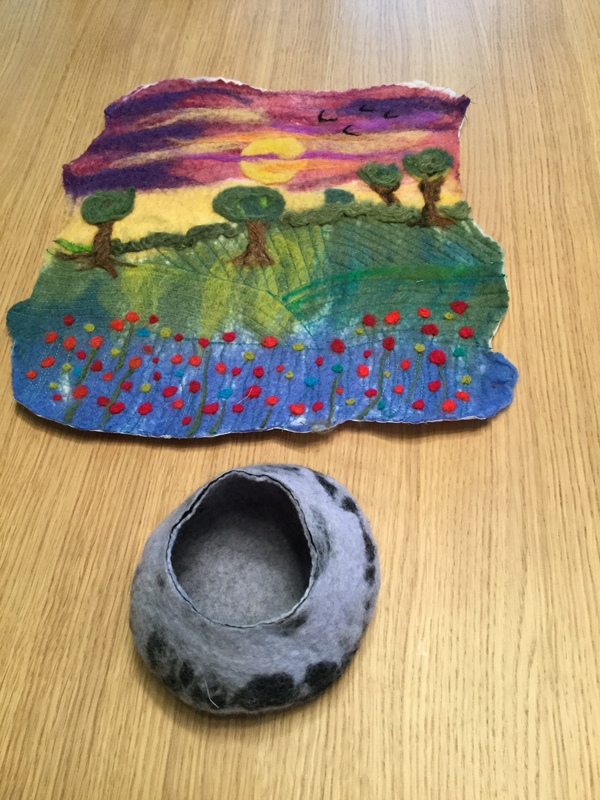 The Final Show and Tell…..
My first stint at tutoring a residential weekend came to a close this afternoon with the final show and tell at Cober Hill. 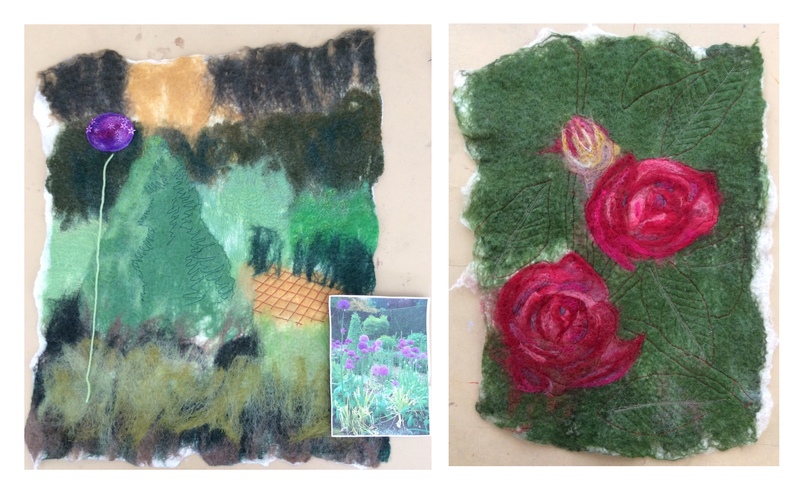 It’s been a terrific three days spent with the 18 creative ladies from the East Yorkshire Embroidery group. They don’t shy away from putting in the hours and the effort to learn a new skill but at the same time they certainly know how to enjoy themselves! 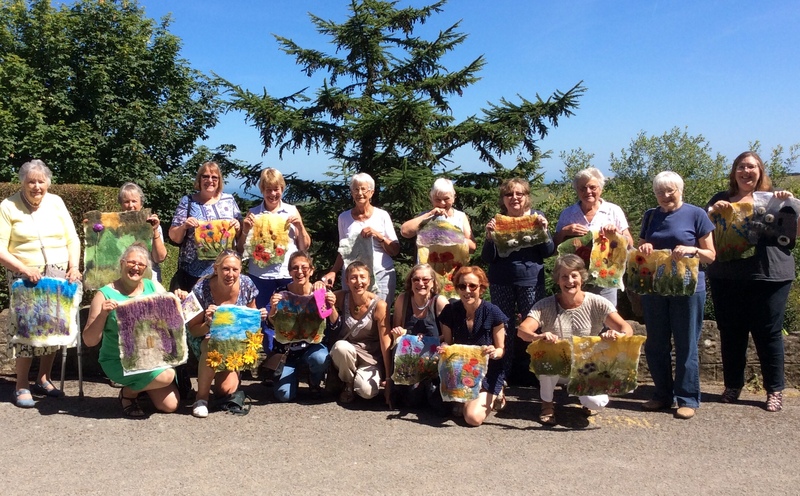 We’ve had lots of chat, lots of laughs and the ladies have produced lots of wonderful work. 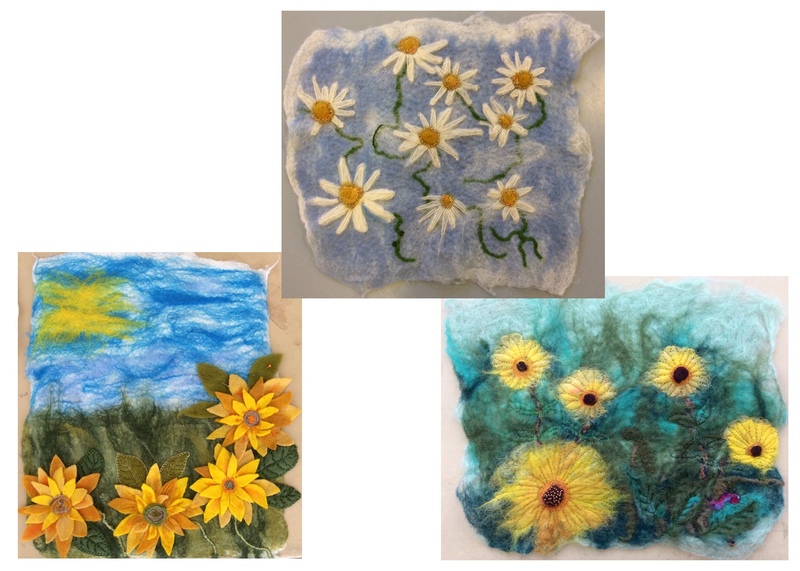 It’s worth remembering that for many this was their first attempt at feltmaking……..
A huge thank you to Maggie and Carol for giving me this opportunity and I hope to work with you all again sometime in the future. 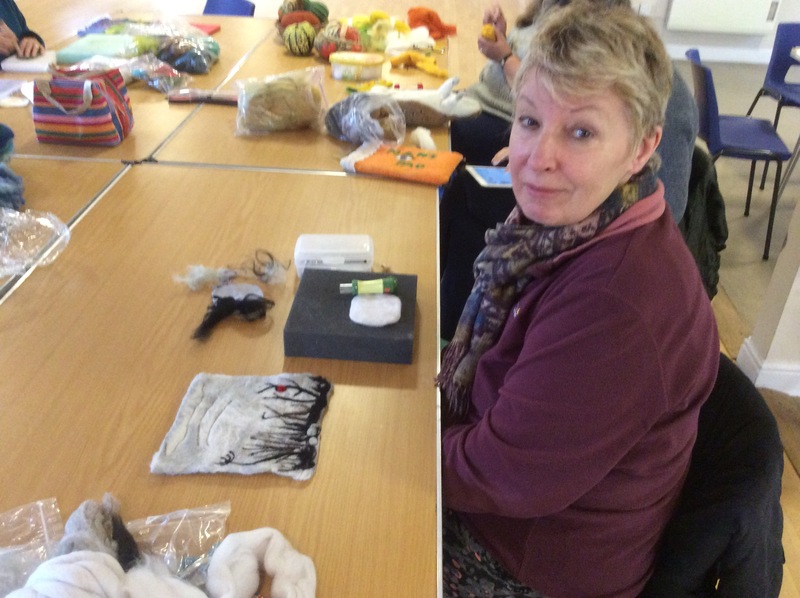 Last week I did a one-one Workshop for Alison who wanted to learn how to make a wet felted fish. 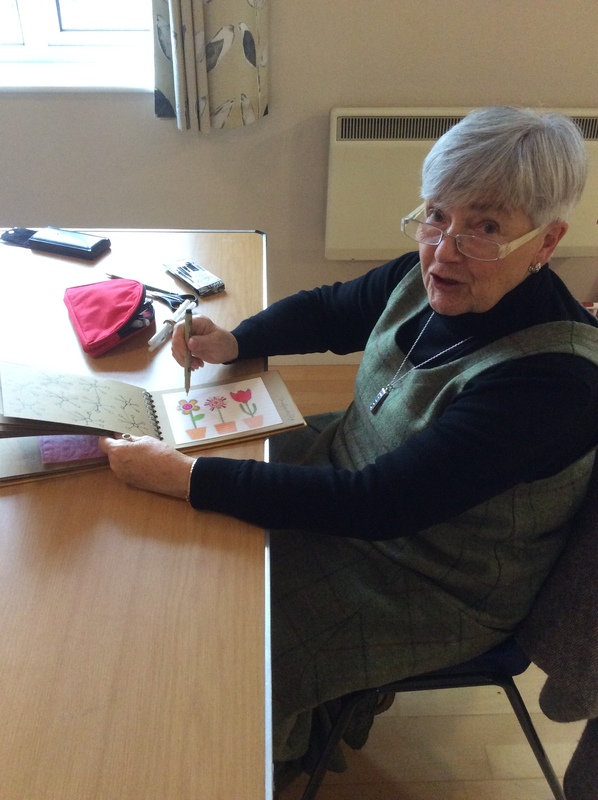 This wasn’t to be any old fish, Alison made it quite clear that she was on a mission to create a Wrasse as part of a local community project. I’d never heard of a Wrasse so immediately turned to Google to see what it was we were aiming for. I discovered that there are over six hundred species of this fish with two being native to the British Isles, the Ballan Wrasse and it’s more colourful cousin, the Cuckoo Wrasse. 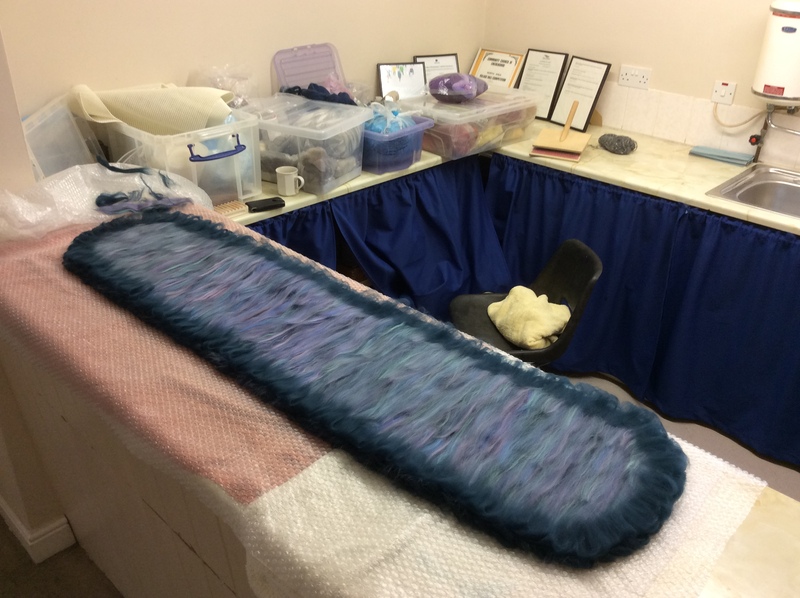 This is how he looked once Alison had got him home and dried out, prior to embellishing…..
…..and this is the finished Wrasse complete with hand embroidery and an impressive set of dentures! Isn’t he handsome! 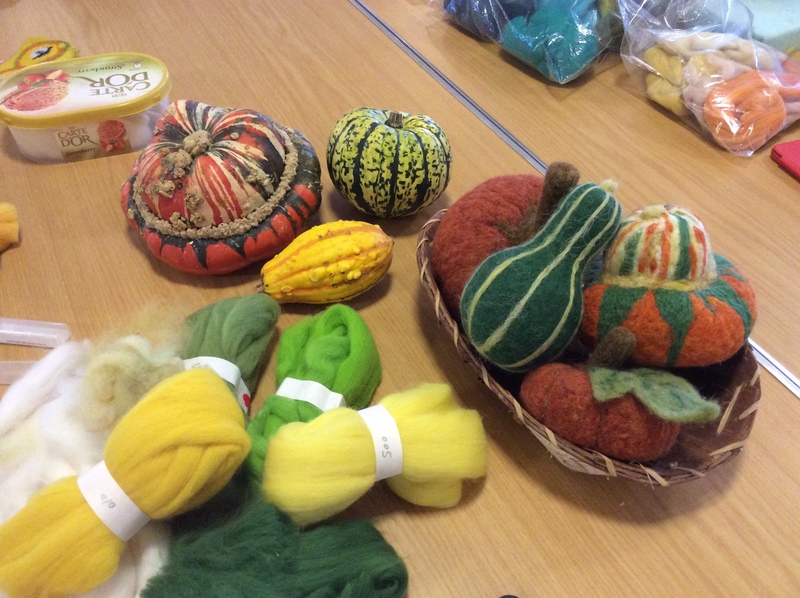 Well done Alison, can’t wait to see what you make next! 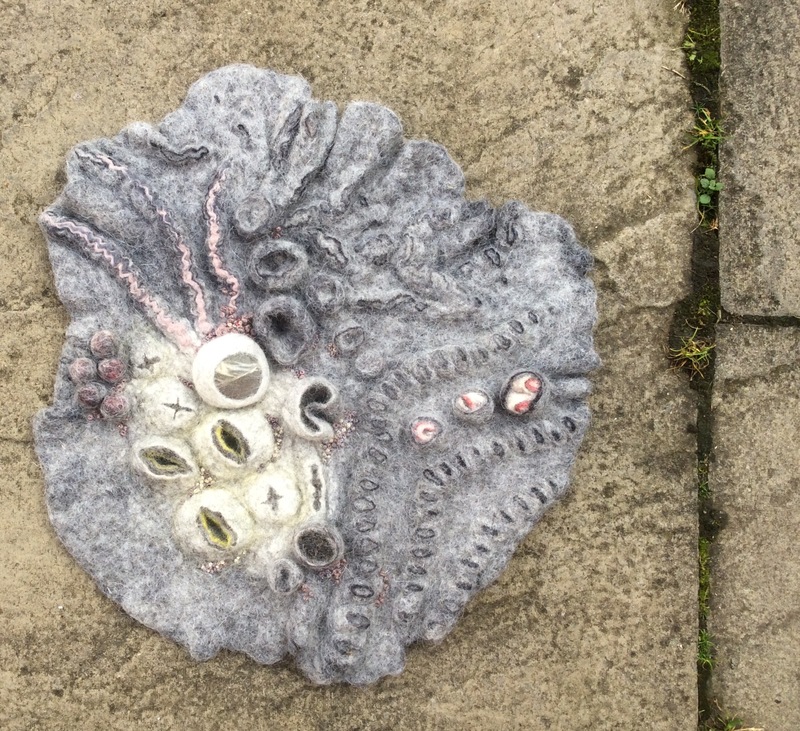 This is my latest “Ullapool/Ardmair” inspired piece. I wanted this textural necklace to capture the atmospheric beauty of the monochromatic grey days and the grey pebble beaches, punctuated by the yellow/green of the seaweed and the lichen on the rocks. 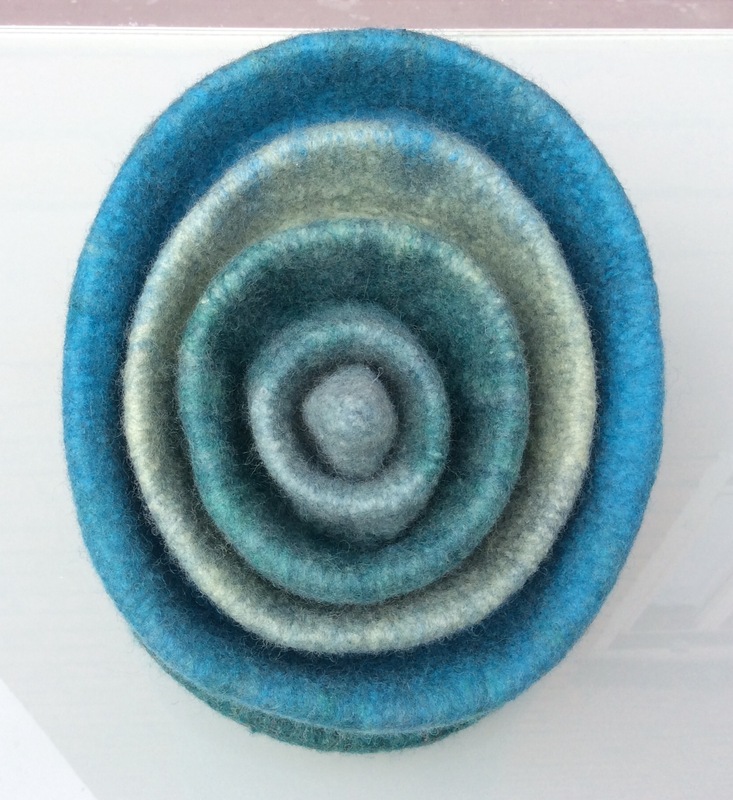 The necklace is made from grey, taupe and white Merino with just a hint of yellow added. 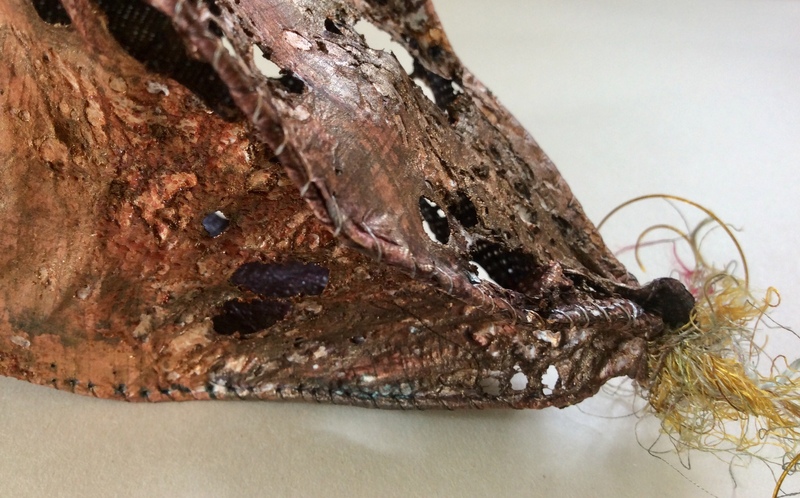 It was embellished with Colonial knots made using Madeira metallic threads. 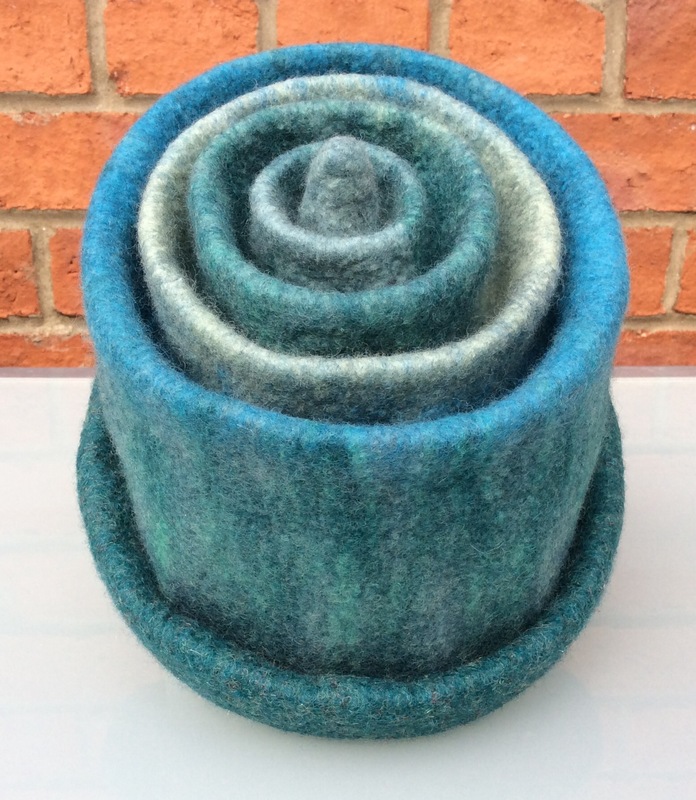 The next piece, Rock Pool, is approximately 38cm diameter made from Bergschaf, Merino and found objects and features shibori, resists, inlays and stitching…. 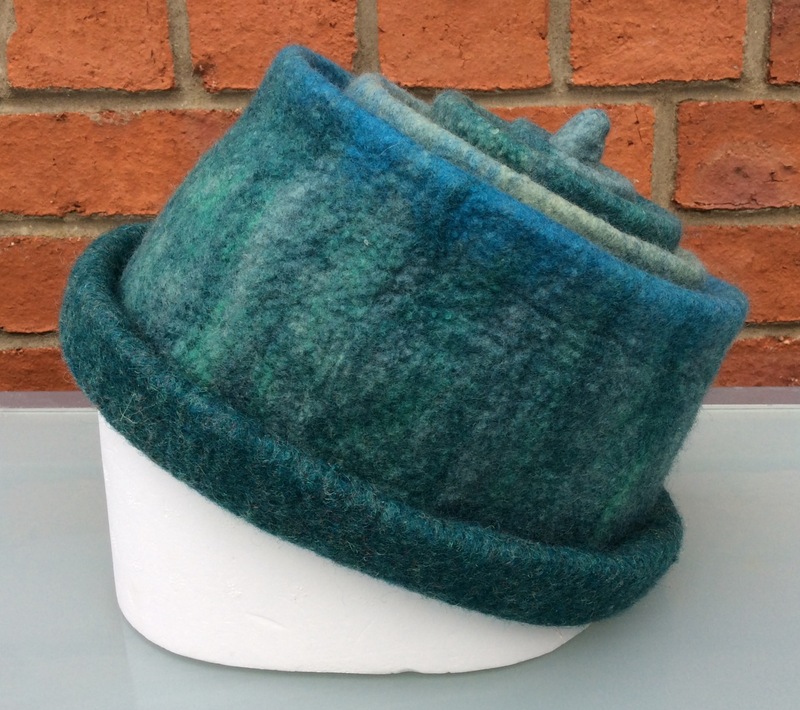 Back in the Summer I read a post on the Felting & Fibre Studio about a concertina hat workshop being run by Teri Berry. It sounded really interesting but at that time I couldn’t commit due to holidays and other workshops. 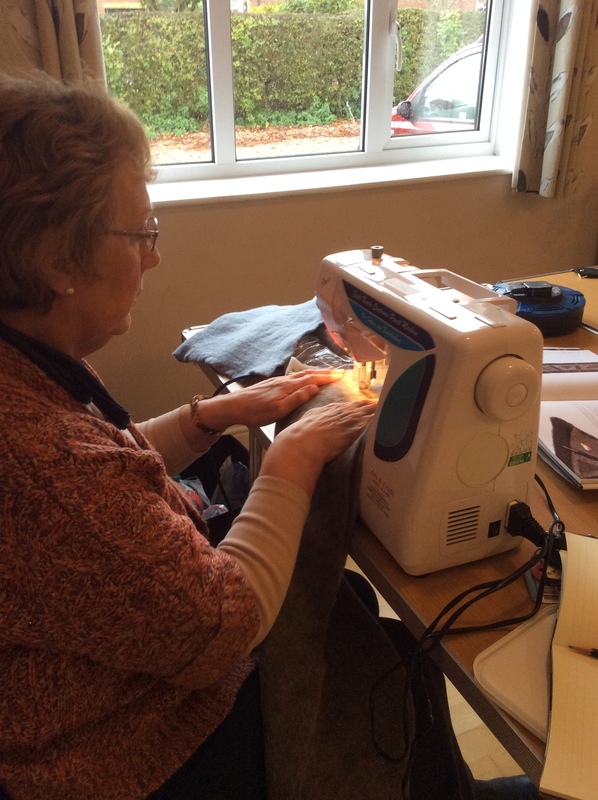 Fortunately Teri’s first workshop was such a huge success that it is being run again this month. 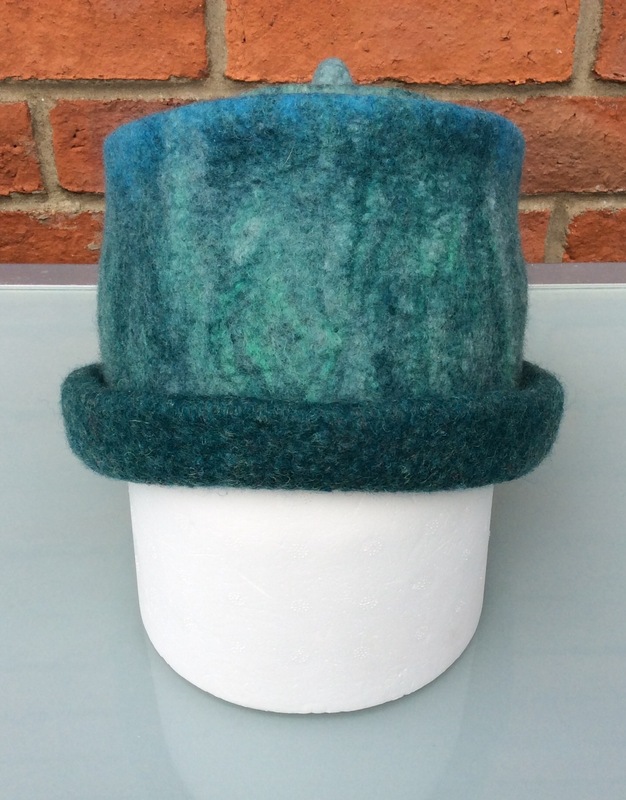 As a result I’ve just finished my first wet felted Merino concertina hat and I’m really happy with how it turned out. 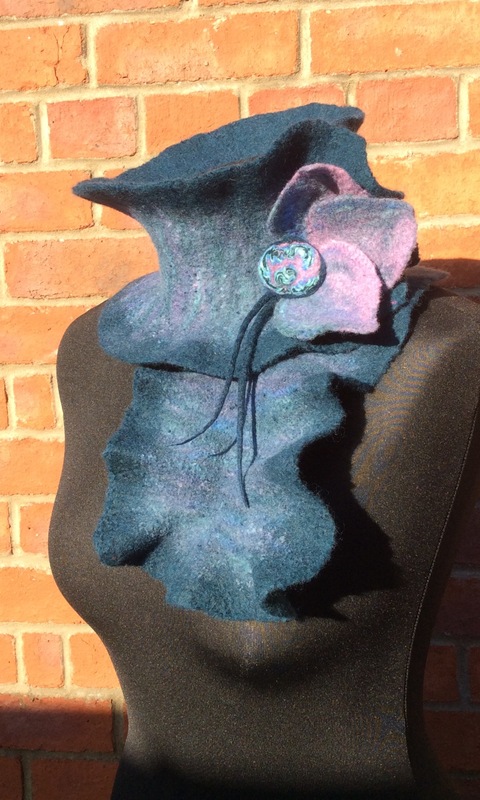 I’m now looking forward to trying out the next design which is Teri’s wacky but wonderful “Snail Hat”…….watch this space! 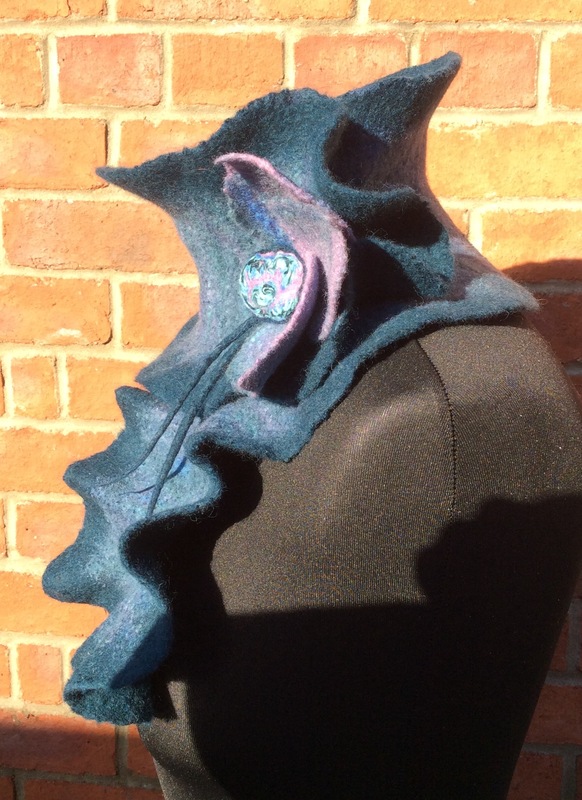 This is the finished blue and pink Merino sculptural collar which I started last week at Felt Inspired in Belchford. 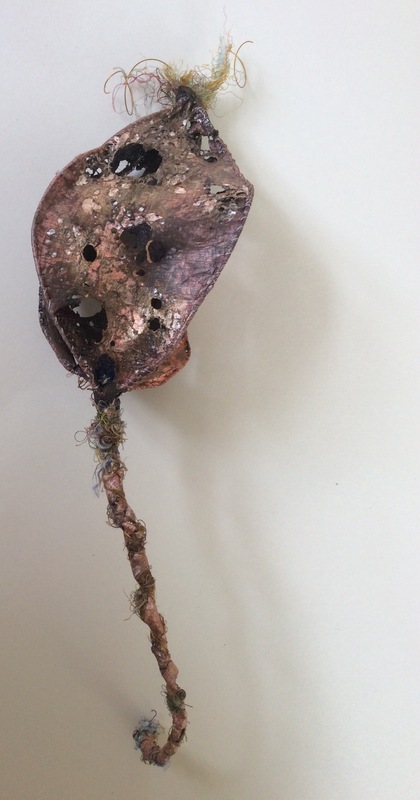 I used a press stud fastener to hold it in place and added a wet felted floral detail including three leaves, two cords and a ‘rainbow bead‘. 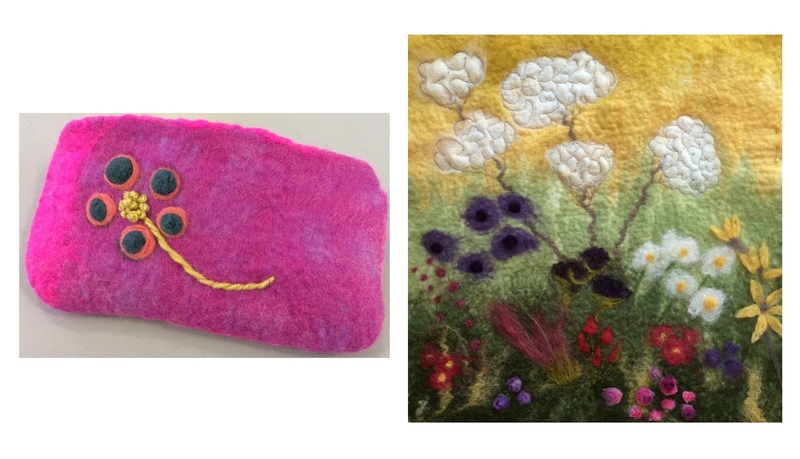 I learnt the rainbow bead technique from the wonderful Dutch felt artist Annemie Koenen. They take a crazy amount of effort to make but are so beautiful it’s well worth it! Where does the time go….. 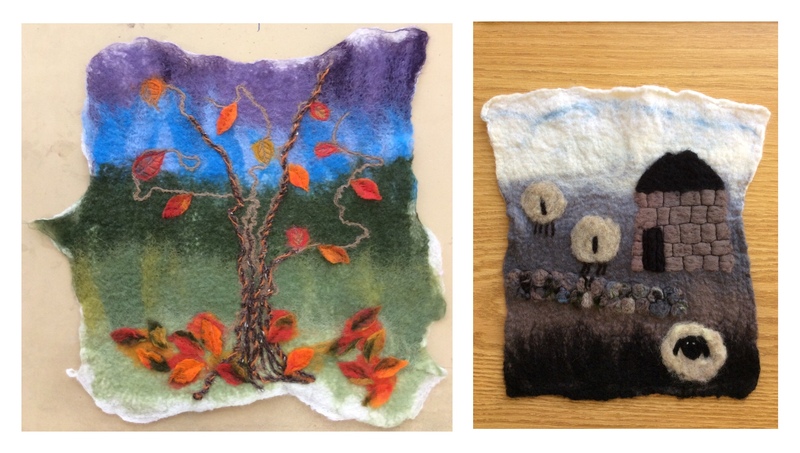 I can’t believe it’s been a month since we started the felting group in Belchford. 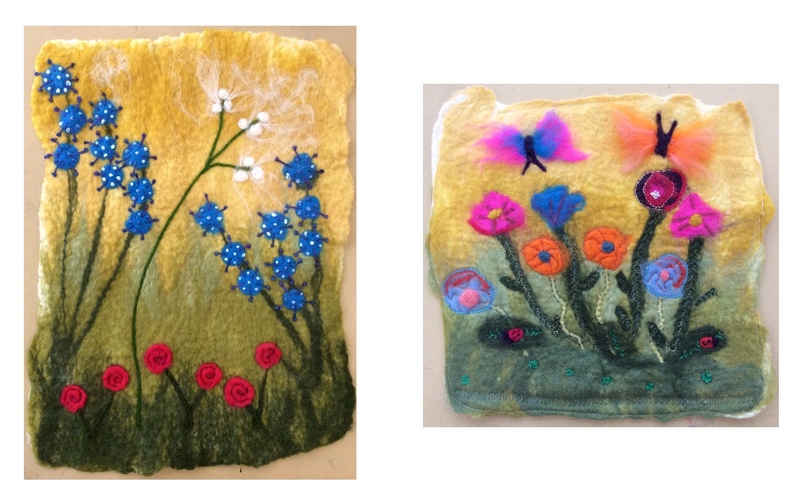 Where does the time go…..
Once again we had eight ladies gathered for a felting session. 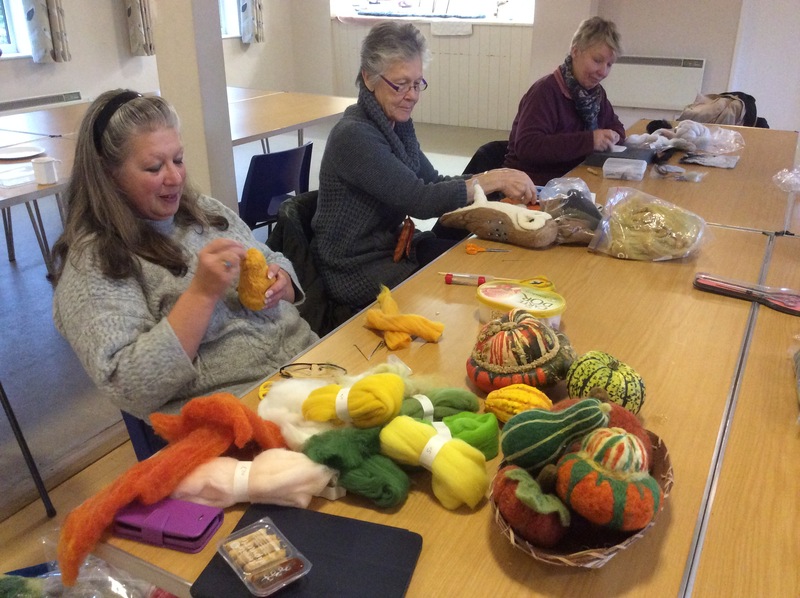 Val and Karen couldn’t make it this month but we welcomed two new faces, Ann and Sheila. 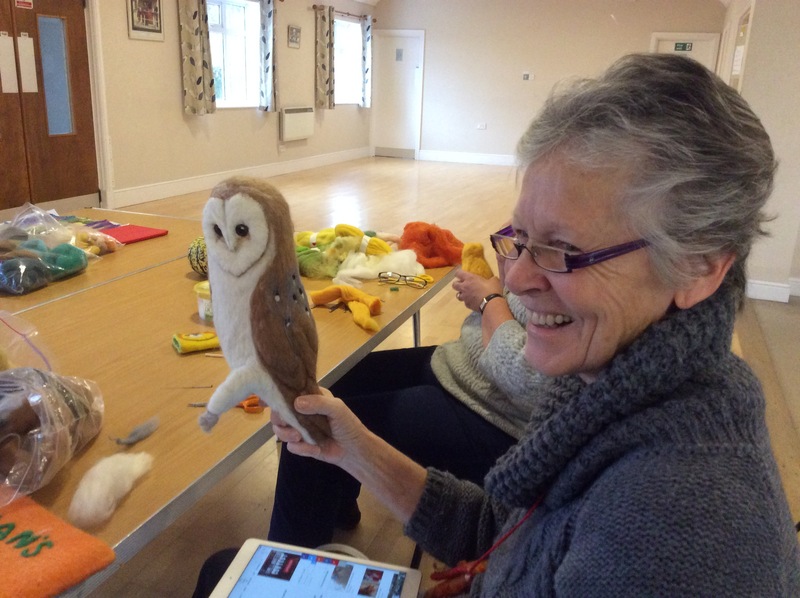 Sheila brought her current project to work on which is a very handsome needle felted owl….. 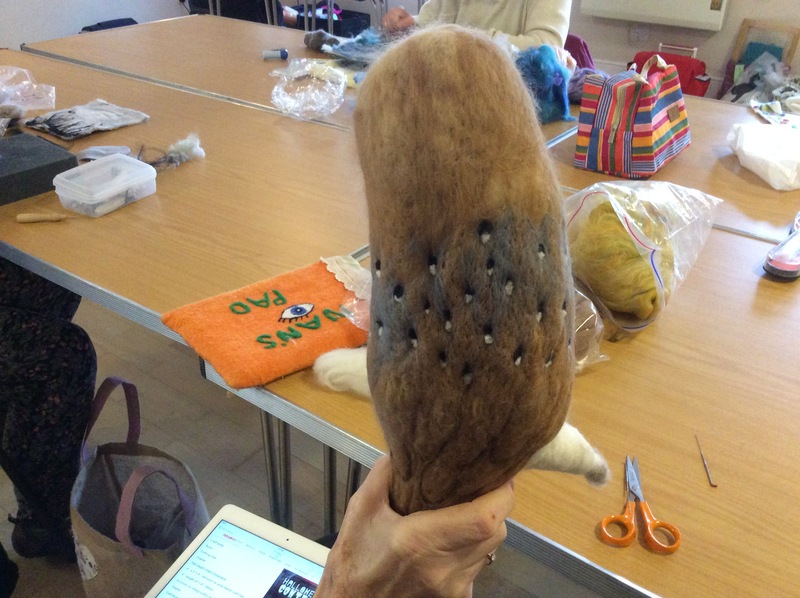 Adding feather detail on the back. 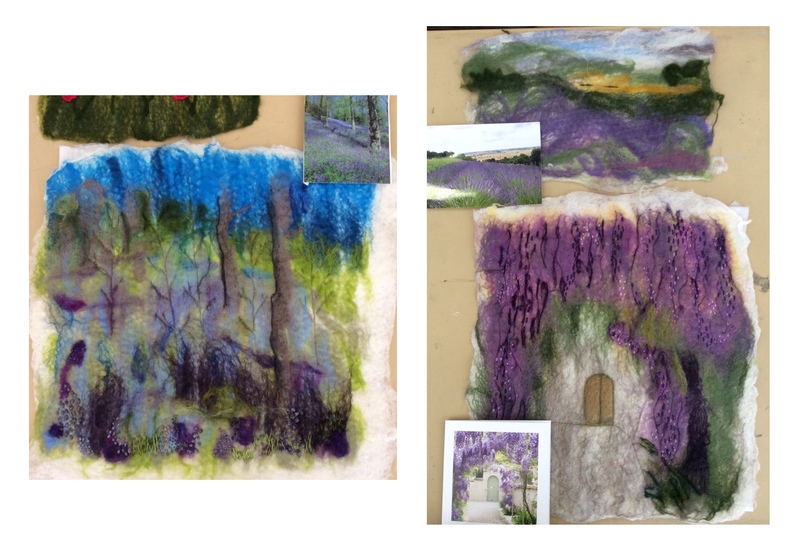 Ann began working on a needle felted landscape and I’m loving the colour scheme…..
Rosie was busy with her beautiful new wool making more vegetables (we’re starting to suspect an obsession here!)….. Looking good enough to eat! 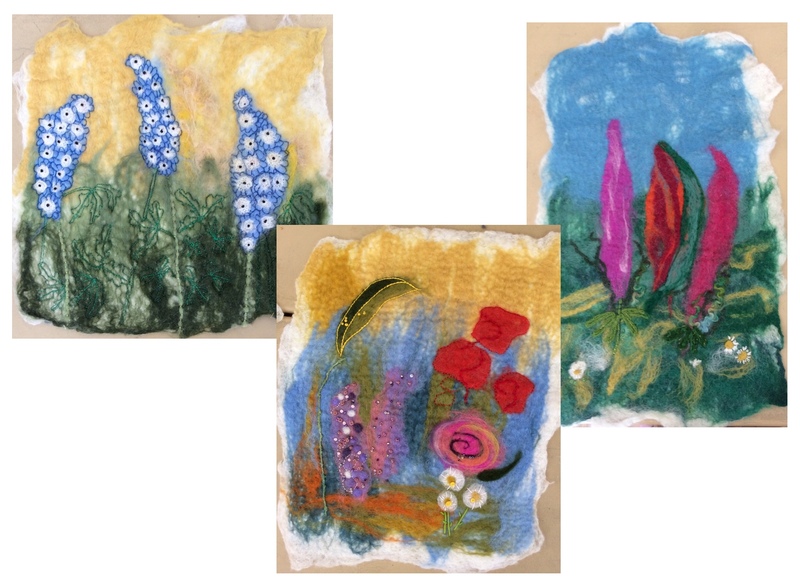 Olga was working on her sketchbook ideas for new projects…..
Olga working on ideas in her sketchbook. 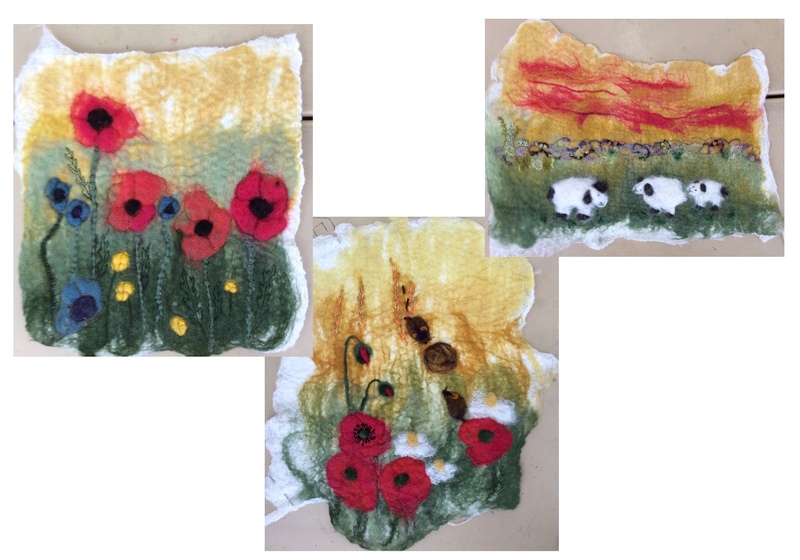 Pat was busy with embellisher…..
Janet made a wet felted bowl and then did some more work on the lovely picture she started last session…. 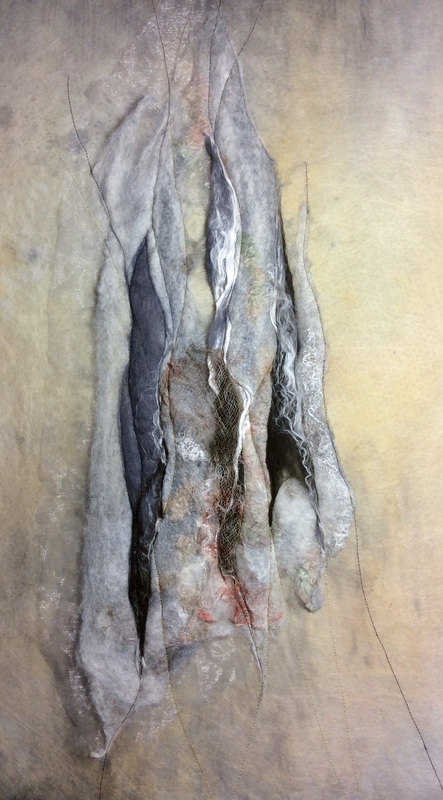 Fibres laid out ready for felting. All in all another enjoyable day in Belchford.